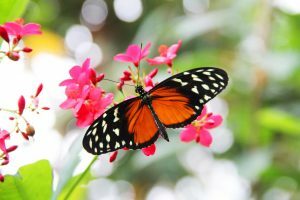 On Saturday (March 11th), Franklin Park Conservatory and Botanical Gardens opens the 24th year of its most iconic springtime exhibition: Blooms & Butterflies. Jenn Wilson, Director of Marketing and Visitor Experience at FPC, shares what you can expect from this year’s immersive, up-close experience with native and exotic butterfly species. Wilson shares how, “each week, hundreds of butterflies from around the world arrive in chrysalis form at the Conservatory.” The chrysalises are displayed in the environmentally controlled Emergence Center where visitors can watch adult butterflies emerge. Then, the newly emerged butterflies are released into the Pacific Island Water Garden. 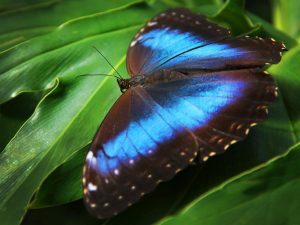 “Hundreds of brightly-colored butterflies, of all sizes, enjoy the warm and tropical climate of the indoor garden, flying freely among visitors and feeding on nectar from colorful blooms,” Wilson explains. During the summer, Blooms & Butterflies extends into the Pollinators Garden (located on the Conservatory’s Scotts Miracle-Gro Community Garden Campus). “A Native Butterfly Box allows visitors to see Monarch caterpillars transform into butterflies,” adds Wilson. Visitors can watch butterflies take their first flight into the Garden during staff-led butterfly releases at 1 and 3PM each day. The artists of Open Door Art Studio & Gallery invite you to take part in an artistic Efflorescence. Open Door artists have worked, honing their artistic talents to cultivate an exhibition comprised of beautiful floral-themed artworks. Immerse yourself in the creativity and imagination of over 70 works from 32 Open Door artists. Stroll through a life-size, whimsical fairy garden. Discover the twisting chaos of the English Stumpery. Its weatherworn stumps and limbs provide the perfect habitat for woodland dwelling fairies and gnomes. Marvel at the variety of unique approaches to making fairy gardens, and see how many fairies you can spot along the way. Over 100,000 flowering tulips, narcissus, hyacinth and much more can be seen planted throughout the park and Conservatory. Immerse yourself within the hundreds of blooms and the vibrant colors of spring.